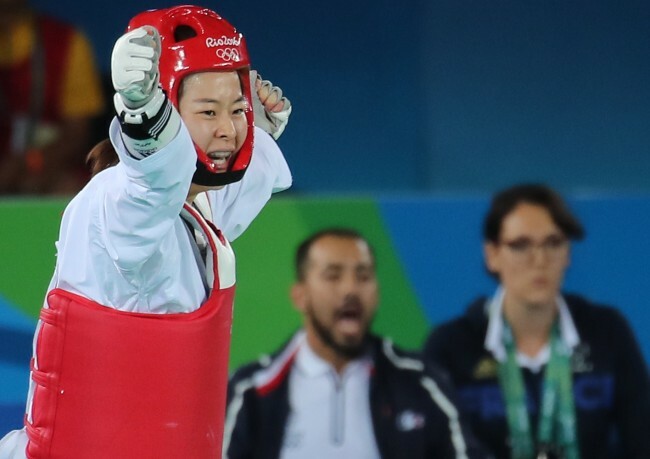 South Korea's Oh Hye-ri captured gold medal in women's -67kg taekwondo at the Rio de Janeiro Olympics on Friday. Oh defeated Haby Niare of France 13-12 in a spectacular, action-packed final for her first Olympic title. South Korea has never missed the podium in the women's -67kg since taekwondo became a medal sport in 2000: four golds and one bronze. Oh, the 2015 world champion in the -73kg, was making her Olympic debut. Oh's was South Korea's fourth medal after three days of competition, and second gold after Kim So-hui's title in the women's -49kg. Oh defeated Melissa Pagnotta of Canada 9-3 in the round of 16, and then Chuang Chia-Chia of Chinese Taipei 21-9 in the quarterfinals. In the semifinals, Oh got past Farida Azizova of Azerbaijan 6-5 to set up a meeting with the world No. 1 from France. Niare took the early 3-0 lead with a successful kick to the head. After the French woman added another point, Oh got three points back with a turning kick. She then added six points in the blink of an eye with consecutive kicks to the head. The two fighters, clearly at the top of their game in the biggest moment, really duked it out over the final stretch. When the dust settled, Oh emerged victorious by the narrowest of margins. "I still can't believe what happened; I am glad I don't have to fight another match," Oh said with a smile, with sweat still dripping down her face. "I'd like to say everything was perfect today." She finally made her Olympic debut this year in her third try. In the national team trials for the 2008 Beijing Games, she lost out to Hwang Kyung-seon, the eventual gold medalist. Oh graciously served as Hwang's training partner. Before the trials for the 2012 London Olympics, Oh suffered a thigh injury, as Hwang again got the nod and defended her gold medal. The third time was the charm for Oh, who said her victory over Niare seemed surreal. "I've always done the best I could, but I have finished second many times," Oh said. "Today, I gave it my all and the result was fantastic. I've been really happy just getting ready for the Olympics. Everything has been perfect." Oh also became the oldest South Korean taekwondo medalist, by beating Niare. When told she was the oldest Korean to win a taekwondo medal, Oh said with a smile, "Is that a problem?" She added the late start to her Olympic career afforded her aproper perspective. "If I had made the Olympic team at an earlier age, I don't think I would have appreciated this opportunity," she said. "I don't think I have that much time left in the sport. I was just grateful for the opportunity to train. I got to enjoy even the most rigorous workouts." She said she went back to the drawing board with her coaches to figure out what had gone wrong in the past. "I felt I was lacking something and that there was a reason I was losing (internationally)." she said. "And I started doing weight training more earnestly. It's been a long day here and I never felt like I was running out of gas. I knew I was prepared." She is at a point in her career where most others would contemplate retirement. Oh said she was only thinking about Friday's final and nothing else beyond it. She said she will think more about her future on her 24-hour flight back home. Oh did admit she'd like a chance to compete at the 2018 Asian Games in Jakarta, because she's never been to one.